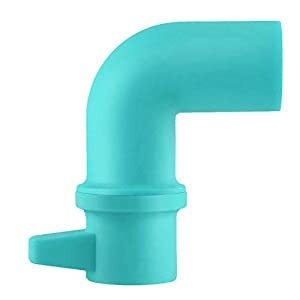 [Directs the steam to wherever you need it to go] – you can adjust the steam pipe to emit the steam in any direction. It can turn in a 360° radius. Risk of burns reduced and It protects your walls, cupboards, cabinets or other obstacles from steam. No mess anymore when finished venting. [Stands up straight] – Similar products on market fall off easily causing the pressure to release. 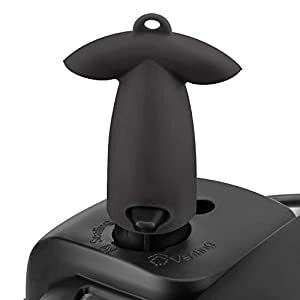 To solve this problem, we design the structure and hardness of silicone to make sure it fits the instapot venting knob snuggly, so it doesn’t lean and stands up straight. [Fits more IP models] – Whether your instant pot is Mini, 5qt ,6qt or 8qt, all IP DUO models, Ultra and Smart Models will be well fitted. – DOES NOT FIT LUX MODEL- PLEASE TAKE NOTE. Designed for Duo 3, 5, 6 Quart, Duo Plus 3, 6 Quart, Ultra 3, 6, 8 Quart, Smart 6 Quart, Lux 3 Quart. Same as original float valve to build and maintain pressure. NOT Fits Lux 5, 6 Qt. Easy to install and relocate for cleaning. 【FIT DUO AND SMART MODEL】Fit Instant Pot Duo, Duo Plus and Smart model, do NOT work on Lux and Ultra. Small size and symmetrical design, makes it well fit and stands up straight, no pressure escape during cooking. 【CABINET SAVIOR】The steam diverter can direct steam to the counter, protect your wood cabinet away from moisture and warping. 【FOOD GRADE SAFETY】The vent diverter is made of food grade silicone, safety you can trust. MUST-HAVE KITS – 13 must-have accessories for your electric pressure cooker, your best assistant to make all kinds of great things in the kitchen. 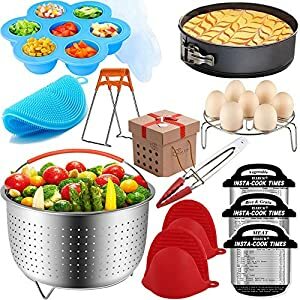 They include 1 steamer basket, 1 springform pan, 2 egg steamer racks, 4 cheat sheet magnets, 1 egg bites mold,1 tong, 1 plate gripper, 2 silicone gloves. QUALITY ASSURANCE – 100% inspection before shipment to make sure the products remain intact when you receive them. All the KYONANO electric pressure cooker accessories meet FDA food-grade levels. The steamer basket, egg racks and tong are made of food-grade 304 stainless steel. The egg bite mold and its lid, mitts and the other silicone parts are made of high-quality BPA free silicone. 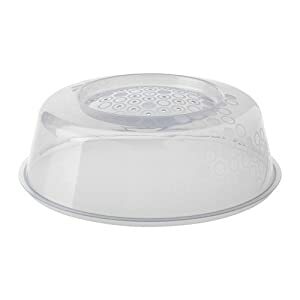 PREVENT NUTRITIVE LOSSES – The steamer basket provides the best method to preserve easily damaged nutrients when cooking or reheating your food. Follow the cook times and water ratios on the cheat sheet magnets to prevent over-cooking your food. Over 65 common food including grains, beans, vegetables and a variety of meats are covered to help your family stick to a healthy diet. 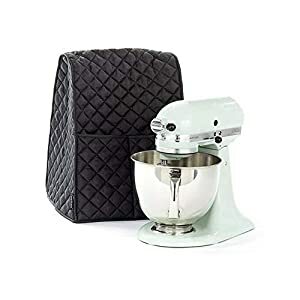 Dustproof & Durable Mixer Cover: Keep your Kitchen Aid Tilt-Head stand mixer in pristine condition with this cloth cover. Heavyweight quilted construction. Waterproof: Surface material made of Polyester Taffeta, keep the machine from erosion by the vapor. Easy To Store And Clean: With the mini size storage bag included, it is quite convenient to pocket storage. You can wipe with damp cloth to clean the dust. And it is machine washable to rinse the oil stains. 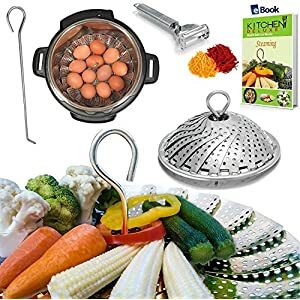 EASY TO USE & DISHWASHER SAFE – The Kitchen Deluxe steamer insert for vegetables uses Premium quality stainless steel that presents as a Beautiful brushed metal. From Busy Moms cooking Baby Food to College Students to Home Cooks. These gadgets are a definite for anyone who wants to get More Veggies into their Diet. 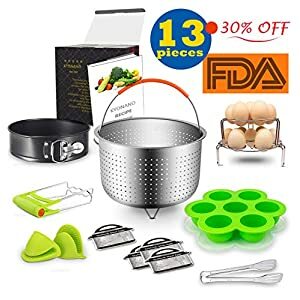 EXCLUSIVE BUNDLE – SAFETY TOOL – RECIPE EBOOK – JULIENNE PEELER – Premium stainless steel Vegetable Steamer Basket (diameter – 6.4″ to 10.3″, leg height – 0.9″). Ultra sharp Julienne Veggie Peeler (worth $9.95). Safety Tool allows easy removal using Removable Solid Center Loop. Downloadable Steaming Cookbook (SENT VIA EMAIL) full of healthy, tasty recipes. 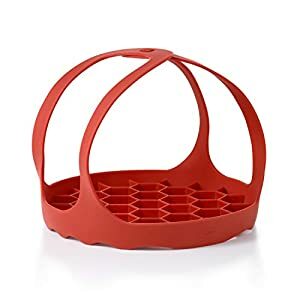 EASY TO CLEAN & COMPACT STORAGE – Expands & adjusts to fit various pot and pan sizes unlike silicone steamers & baskets; turning any pan into a veg steamer in an instant. Opens like a water lily and is collapsible to become small and compact to save storage space unlike bulky bamboo steamers. ★SUPERIOR VALUE SET&PREMIUM QUALITY- Our product comes in a full kit which is 12 pieces accessories. This pressure cooker accessories has all you need in making the best meals possible. Made of food grade 304 stainless steel, sturdy and durable,easy to clean,dishwasher safe. Also a Great GIFT Idea! ★PERFECT ACCESSORIES- Fits 6 or 8 Quart Electric Pressure Cooker. 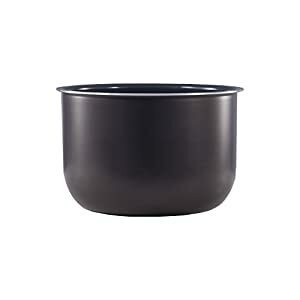 Perfect steamer basket for veggies,meat, hard cooked eggs,1 inch trivet are high enough to keep above the water. Wide and holey baskets allow more ways for steam to penetrate the basket, easy to steam food evenly. ★HEALTHIER COOKING METHODS-Our cheat sheet includes cooking times for 60 common foods in the Pressure Cooke or similar appliances, No more looking it up on a computer, smartphone or manual. Now it is on a magnet which easily sticks to your appliance or Pressure Cooke. 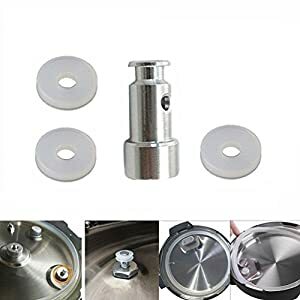 ✔ COMPATIBLE / PERFECT FIT – A perfect sealing fit for Instant Pot models 5 Quart and 6 Quart Instant Pot Tops (IP-DUO60, IP-DUO50, IP-LUX60, IP-LUX50, Smart-60, IP-CSG60 and IP-CSG50). Perfectly sized for sealing during pressurized cooking without steam escaping. 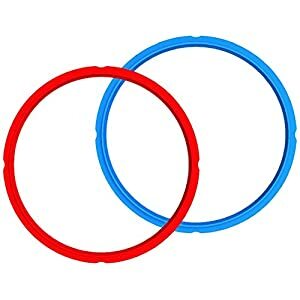 ✔ DISHWASHER SAFE- Our Insta Pot Silicone sealing rings are dishwasher Safe & Freezer Safe. 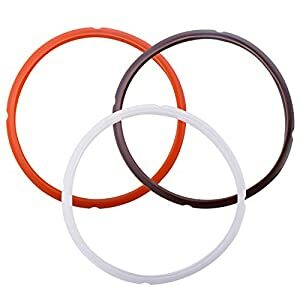 Our Hot & Cold resistant silicone pressurizing rings withstand temperatures from -40 to 500 degrees. To clean an Instant Pot silicone lid accessory, simply put the cover into your dishwasher for cleaning, sterilization — or even lightly boil in water. 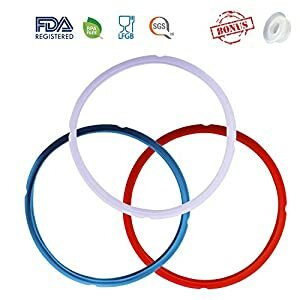 [Extra 3 Colors and Free Sealer] – Set includes 3 colored rings and a free sealer. Different colors can be used for different types of cooking: meats, desserts and yogurt. Never again get mixed odors. 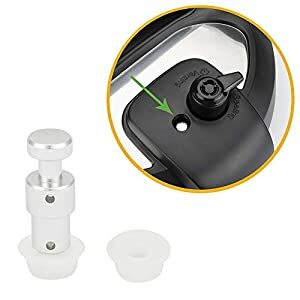 A bonused universal replacement sealer fits the lids of almost all pressure cooker universally. 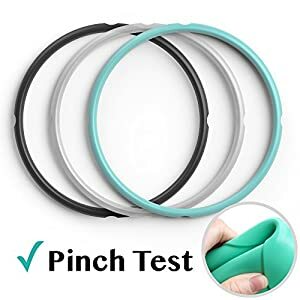 [Durable and Lasts Longer] – Made from high tear strength silicone with excellent tolerance of temperatures within a range of -30 °C~350 °C . 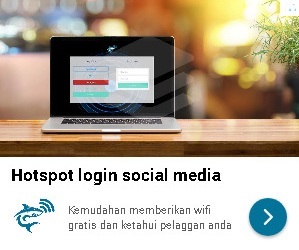 Enable you for a very long-term use. Made from durable silicone compound that’s dishwasher safe, BPA Free, and Food-Safe. ✔️GIFT IT – Wrap it up and put it under the tree or stuff it in a stocking to make a perfect holiday gift. ✔️ FUN DESIGN – Choose from Henry or Ruby to end your recipe and have more fun! 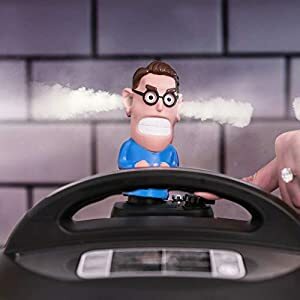 The release of steam through the ears of the funny looking character attached on top of the valve will never fail to give your friends and family a good laugh. ✔️ NO MORE DAMAGED CABINETS – specifically designed to safely divert steam to the side instead of up into your cabinets, our steam diverter keeps your kitchen mess free and clean. It prevents moisture that may harm or cause molds on your wooden cabinets.